Eat Is Salt Lake City the Best Cheap Burger Town in America? Is Salt Lake City the Best Cheap Burger Town in America? From pastrami burgers to fry sauce, a distinctive—and gloriously old-school—patty culture thrives in the Utah capital. Salt Lake City’s culinary scene rarely whips up the food cognoscenti into a lusty fervor like Austin, Portland, or Charleston. 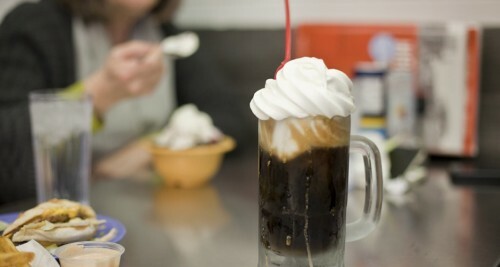 Most assume the city to be culinarily challenged, offering nothing more than bland, staid grub and watered-down beer. But if you’re on the hunt for Americana, Salt Lake City maintains a hidden cache of gastronomic intrigue. It’s a destination rife with drive-ins, mom-and-pop burger stands, and small, independent fast-food chains, which dot the valley like sesame seeds on a toasted bun. Together, these spots form a proud tradition that binds the city together—after all, the holy trinity of hamburger, fries, and a thick, frosty shake is a corporeal pleasure that even Mormons can enjoy. The proliferation of quick and easy burger restaurants can be traced to the early 20th century, which brought the first waves of immigrants to the developing city when it needed a fresh labor force to work the mines and railroads. It was the Greeks who first flocked, worked, and then stayed for generations, developing small businesses, diners, and—of course—burger joints. Astro Burger, Apollo Burger, Crown Burger, and Olympus Burger are just a few among dozens with Greek lineage, which is evidenced by the gyros on their menus and baklava at their counters. 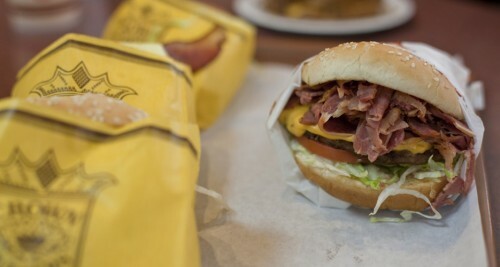 Pastrami burgers are another local passion. Born in Los Angeles but flourishing in the SLC, the salty meat-on-meat creation is a requisite for any local burger stand. It’s easier to get the rosy slivers piled high on a cheeseburger than in a deli sandwich. To help you navigate the offerings, here are five Utah born-and-bred burger joints, leagues above any national chain, where you can get a true taste of the local patty culture. Salt Lake City’s culinary scene rarely whips up the food cognoscenti into a lusty fervor like Austin, Portland, or Charleston. Most assume the city to be culinarily challenged, offering nothing more than bland, staid grub and watered-down beer. But if you're on the hunt for Americana, Salt Lake City maintains a hidden cache of gastronomic intrigue. It's a destination rife with drive-ins, mom-and-pop burger stands, and small, independent fast-food chains, which dot the valley like sesame seeds on a toasted bun. Together, these spots form a proud tradition that binds the city together—after all, the holy trinity of hamburger, fries, and a thick, frosty shake is a corporeal pleasure that even Mormons can enjoy. The proliferation of quick and easy burger restaurants can be traced to the early 20th century, which brought the first waves of immigrants to the developing city when it needed a fresh labor force to work the mines and railroads. It was the Greeks who first flocked, worked, and then stayed for generations, developing small businesses, diners, and—of course—burger joints. Astro Burger, Apollo Burger, Crown Burger, and Olympus Burger are just a few among dozens with Greek lineage, which is evidenced by the gyros on their menus and baklava at their counters. Pastrami burgers are another local passion. Born in Los Angeles but flourishing in the SLC, the salty meat-on-meat creation is a requisite for any local burger stand. It’s easier to get the rosy slivers piled high on a cheeseburger than in a deli sandwich. To help you navigate the offerings, here are five Utah born-and-bred burger joints, leagues above any national chain, where you can get a true taste of the local patty culture.